My dad’s a geologist. Does this make me an expert in geology? Did I somehow inherit his geological expertise? Was I born with the knowledge to discriminate the difference between igneous, metamorphic, and sedimentary? Would it make sense for me to make the claim that I am a “second-generation geologist”? Umm… nope. A person can’t just inherit an expertise in geology – you have to do your own work, and put in your own study of it to be able to make the claim that you’re a geologist. This holds true for any science, really – including Christian Science. Just because one’s grandparents or great-grandparents called themselves Christian Scientists doesn’t make one an expert in Christian Science, or the best practitioner of it. I mean… well… calling yourself a “third generation Christian Scientist” makes about as much sense, really, as calling yourself a “third generation geologist” – right? Lately I’ve found myself making a distinction between the religion of Christian Science and the science of Christian Science, and this has led me to some interesting musings about the nature of my way of life. But if you think of Christian Science as an actual science, rather than a religion, this opens up a whole ‘nother way of looking at Christian Science, doesn’t it? I know there are people who have found the Science of Christianity for themselves – who’ve never stepped foot in an actual Christian Science church, and are not particularly interested in the human organization of the Christian Science religion – but are practicing and proving the Science of Christianity daily in their lives. And wouldn’t we call them “Christian Scientists”, too? Is it possible to be a non-Scientific Christian Scientist? And – contrariwise – is it possible to be a non-religious Christian Scientist? I’ve come to believe the answer to the first question is no. And I’ve come to believe the answer to the second question is yes. I myself am not what you would call a very “religious” person, I guess. I enjoy going to church for the like-minded fellowship I find there, and the inspiration and uplift I get from my fellow Christian Scientists – I’m blest to be part of a Christian Science branch church that’s very loving and compassionate in its support for its members and its loving outreach to the community. But, to be honest, I’ve never felt comfortable surrounding myself exclusively with other people who call themselves “Christian Scientists” or isolating myself from the rest of humanity to hang out with people who only speak Christian Science-ese. That just has never felt healthy to me. There’s a sort of group-think about it that makes me a little wary. And – as far as religion in general goes – I’ve never been big into tradition or dogma, and the “exclusivity” often found in religion has never much appealed to me. When Mary Baker Eddy first re-discovered the Science of Christ-healing that Jesus practiced more than 2000 years ago she hoped she could introduce it to humanity through the religious institutions that were already in place. She soon realized that the religious institutions of that time weren’t ready to open their doors to Christian Science. And so she established her own religion to spread the word of her discovery. But I don’t believe she ever meant for the religious institution to be the most important part of her legacy to us. I believe she viewed the human organization as the necessary tool for sharing her discovery – but I don’t think she thought the religion of Christian Science was as important as the Science of Christian Science. Question. – Are doctrines and creeds a benefit to man? Science of healing, divine Science, Science of Creation, Christian Science, Science of Mind, Science of being, Science of Genesis – these are all terms one can find in the Christian Science textbook, Science and Health with Key to the Scriptures by Mary Baker Eddy. And I’d like to humbly suggest another term for a study that I have found to be demonstrable and practical: Kindness Science. Recently I was involved in a dialogue about the nature of science. Actually, “dialogue” might be the wrong word to use here – a dialogue usually involves an exchange of ideas, a sharing, an exploration. This was more of a monologue, I guess, or a lecture – with me as the student, expected to sit quietly and listen, while others threw their great wisdom and knowledge at me. I get this kind of thing a lot. I’m genuinely interested in learning what others think, believe, and feel about things, and so I ask people questions, and invite them to share. But, weirdly, I’ve found that people aren’t always so eager to find out what I think, feel, and believe about things. And so I end up becoming the recipient of a one-sided conversation – often with the other person telling me what I think, feel, and believe and judging me based on his own assumptions regarding my thoughts, feelings, and beliefs. It can all be a little odd. Anyway. So in this particular “dialogue” my lecturers let me know how impossible it would be to prove Christian Science to them – that all the evidences and proofs – the physical healings and other demonstrations of Christian Science I shared with them – were just personal anecdotes and proved nothing (in spite of the fact that several of these demonstrations were witnessed by medical scientists), and that I’d have to have at least a level six “sigma” (don’t ask, I’m still trying to figure that one out) if I wanted anyone else to believe what I’d shared. And I know. Personal anecdotes really aren’t proof of anything to anyone but the person who’s actually experienced them, I guess. But there were things in what my lecturers were telling me that didn’t quite add up, either. There was some bias. There seemed to be an inability to separate fact from opinion. And – here’s the thing that really exasperated me – there was a pompous bossiness, too – there seemed to be an expectation that if I were a rational person I would, of course, have the same perspective and beliefs my lecturers have about the world. So. Ahem. I sort of stopped being a good listener at one point. And all hell broke loose. I took a break from the dialogue. Took a nice long walk in the sunshine, weeded the garden, and went to the memorial service of one of my mom’s cousins. Roger had lived a really wonderful life and had a positive impact on the lives of a lot of people. As I listened to all the good that Roger had done for his community – his peace activism, his work on behalf of a clean environment, his scholarly attainments, and the kindness and patience he’d shown to others throughout his life – I felt a little ashamed of myself for my recent impatience and exasperation in the dialogue in which I’d been participating. Memorial services always help me remember what’s really important in life. And what’s not all that important. I realized I hadn’t been practicing my own Science with the dedication and devotion to it that was needed to demonstrate its truth. I decided it was time to practice kindness Science on those very people who would say they don’t believe in kindness Science. I made them a part of my experiment, and a part of my demonstration. I consciously made the decision to respond with nothing but kindness, and with genuine love in my heart towards those with whom I was engaged in The Dialogue. And, as I predicted from my previous experience with kindness Science, those with whom I was engaged in the dialogue responded back to me with kindness, too. And we moved on. “Love is reflected in love,” writes Mary Baker Eddy in the textbook for Christian Science. Through my use of kindness Science, I was, once again, able to prove the truth of this statement for myself. Kindness Science is effectual, demonstrable, provable, practical Science – and it has, I believe, a far more direct and important impact on our lives than, say, the study of the movement of the stars in the sky, or the layers of sediment in a rock wall. Because the Science of Mind seems to bring into dishonor the ordinary scientific schools, which wrestle with material observations alone, this Science has met with opposition… In divine Science, the supposed laws of matter yield to the law of Mind. What are termed natural science and material laws are the objective states of mortal mind… the physical universe expresses the conscious and unconscious thoughts of mortals. God is Mind, and God is infinite; hence all is Mind. On this statement rests the Science of being, and the Principle of this Science is divine, demonstrating harmony and immortality. Well, for instance, when I woke up to find my hand inflated to twice its normal size, and really painful – I couldn’t bend my fingers or anything – I think at first I was kind of… “well, this is interesting”… I wasn’t sure what was going on there. But I got myself dressed and drove to my workplace and I think my thought was that I’d just work around it until it went away or something. But when I showed my hand to my co-workers to see if they’d had any experience with something like this, they were all really scared for me. One of them told me about an allergic reaction that had nearly killed her son. I think three or four other people mentioned that flesh-eating disease or serious infections that had nearly killed them or their loved ones. Everyone advised me to see a doctor post haste. So – I really like my hand, you know – it’s useful and quick and good at sports and kind of attractive, too – although it’s rarely manicured or anything… but I digress… anyway… the thought of losing my hand was pretty scary to me. So I called our family doctor right away and left work to see him. Normally he laughs with me about stuff, but this time he was not laughing. He was pretty serious, actually. He said he thought it was either a serious infection or rheumatoid arthritis – although my case wasn’t typical of either one of those because I didn’t have any open wounds and my joints weren’t inflamed. He wanted to start me on drugs right away – some to address the one thing, and some to address the other – and he wanted to run blood tests on me. I agreed to the blood tests, but I told him I didn’t want to start taking any drugs until I knew better what was going on with me. So I guess the question here would be why I chose not to take the drugs? 1) The one or two times I’ve ever actually taken pharmaceuticals, I’ve always had a bad side effect from them. I might have thought, too, about the time my son had gotten a really bad reaction from one of the ‘cillin drugs. When we went to the doctor to see what we could do about it, he’d said he could give my son drugs to counteract the side effects of the first drug. My son asked him if this new drug might have side effects, too, and the doctor admitted this was the case – all drugs have side effects, he pointed out. I could see the wheels turning in my son’s head – “And then I’d need to take another drug to undo the side effects of the drug I’d be taking to undo the side effects of the first drug?” he asked. The doctor nodded. My son has a pretty-evolved sense of humor. “No, thanks,” he’d said, grinning. We’d gone home and called a CS practitioner, and the side effects had quickly been removed. With no side effects. 🙂 Anyway. So yeah, I guess I’ve become really skeptical about the whole drug-thing from personal experience with it. So I didn’t take the drugs, I went in for the blood tests, and came home and called for prayerful support from a Christian Science practitioner. You are the idea of Love and Truth and Life – eternally perfect and whole, healthy and active, unchanged, undimmed, loved, loving, intelligent, alert, aware of all good. The belief that you can ever be less than your perfect, ideal self, is a lie. The belief that you can ever be separated from Love, Good, God, is a lie. As an idea, you dwell forever within the consciousness of Love. You are the image and likeness of Love. You are the perfect child of perfect Love. You reflect nothing but Love, Spirit, Life, Truth, Principle, Mind, Soul. There’s nothing about you that is imperfect, for there’s nothing in your Father-Mother out of which imperfection could come. When I called the doctor’s office to find out what the results of the blood test were, the receptionist said that one of the markers in the blood test indicated rheumatoid arthritis, and they wanted me to set up an appt with a rheumatoid arthritis specialist. I told her my hand was completely fine now. She was really surprised by this, and called a nurse to the phone to talk to me. I told the nurse the hand was deflated, and there was nothing wrong with me at all. She was… I could imagine her trying to process what I was telling her… she finally said that if anything changed to let them know, but she guessed they wouldn’t “go any further” with it right then. Nova: So, we are talking about a very personal choice, that may appear to be in opposition to something (say, medical science) at some level, but really isn’t against it, per se, but is simply you choosing something else. Scoby: Why do you suppose God would have any preference at all for having his people be healed by means other than these things (vaccinations and antibiotics)? Karen: I don’t think God – the one I believe in, anyway – has any preference one way or the other. I don’t think God has any thought about that stuff at all. And I think when we try to attribute human opinions and preferences to God then we’re anthropomorphizing God. Trying to put God inside some kind of human framework, and limiting God. Love just keeps on being Love, and Truth just keeps on being Truth – and unchanging Love and Truth (God) aren’t affected one way or the other by what humans do or think or opine or prefer. Happy Mother’s Day to Nurturers and Reflections of Love Everywhere! I couldn’t have been more blest than I’ve been to have this beautiful reflection of motherhood for my mom. Moz was wise: I remember coming home from school in the first grade, telling Moz about my day. My first grade teacher was not what most people envision when they think of a first grade teacher – she was not sweet-voiced, smiling, or nurturing. She was, to put it starkly, kind of cranky, and didn’t seem to like her students all that much. What I didn’t know at the time was that my first grade teacher had recently lost her son and husband. She was going through some pretty rough times in her life. Mom didn’t know about any of this, either. But when I came home from school, and told Moz that I didn’t think my first grade teacher liked me so much and that she was a crabby old lady, mom’s response was, “Well, Sweetie, we just need to love the hell right out of her then.” Moz didn’t commiserate with me, didn’t call up the school and complain about this teacher – nope – instead she used this opportunity to teach me a life-long lesson about the power of love. I started my Campaign of Love the very next day, bringing in hand-picked flowers for my teacher, and leaving little notes of love on her desk. And by the time she met with my mom to conference about my progress in school she told my mom how very much she enjoyed me, and how much my kindness had meant to her. Moz was our hero: When my little brother was a toddler he’d gotten ahold of some marbles from somewhere and swallowed them. My grandma was there as my little brother started turning blue. 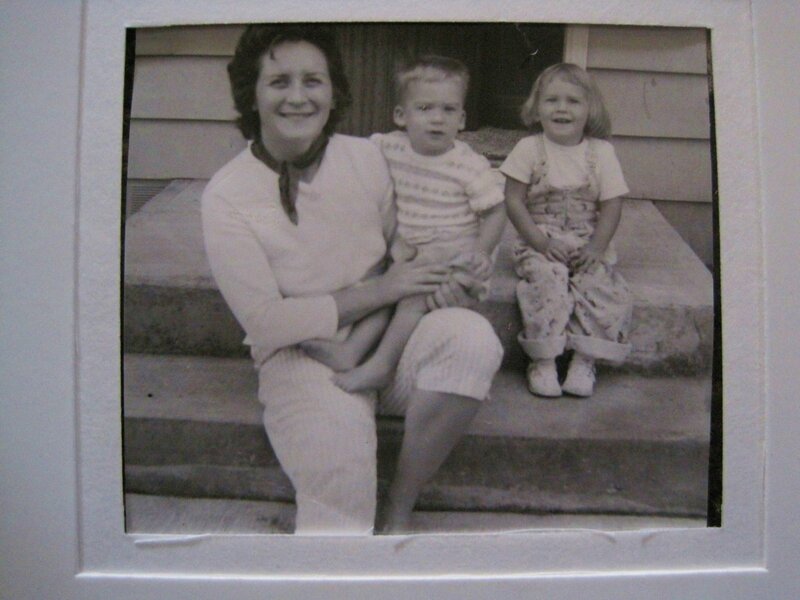 She said to Mom: “We’ve lost him!” Mom grabbed my little brother by his ankles, held him upside down and said, “No,” and wacked him on the back, “we,” wacked him on the back again, “HAVEN’T!! !” and four slimy marbles popped onto the floor. My brother took a big gasp of air and turned back to his normal shade of color. Moz taught us the power that comes with understanding God, Good: When the same little brother was about seven years-old he became very sick. Dad and Mom took him to our family physician who told them that they had a very sick boy – he had mastoiditis. There was a good chance he’d lose his hearing, and he might lose his life. Surgery would probably need to be scheduled for him. Dad and Mom brought my brother home from the doctor’s office and Mom asked Dad (who was not a Christian Scientist) if she could call a Christian Science practitioner for prayerful support and my dad agreed to this. I remember lying in bed that night, listening to my little brother screaming in pain in the next room, and my mom comforting him, singing hymns to him. And then – I remember this very clearly – suddenly he was snoring. The healing was that instantaneous. “He’s healed! He’s healed!” my mom called out – the joy in her voice filling our home. And he was, too. The next day the doctor confirmed that my little brother was well. And he never lost his hearing, either. Moz thinks of herself more as a hobbit than an elf – she likes being home, puttering around in the garden, taking care of her cats, llamas,and goats, and keeping the bird-feeders full for her feathered friends. But make no mistake – if she’s a hobbit, she’s more a “Baggins” kind of hobbit than a regular hobbit. She has had her share of adventures in life. She’s climbed Mount Rainier twice, ran track in college, birthed three children – and all this after she was apparently told as a youngster, following a bout with rheumatic fever, that her heart had been damaged and she should lead a quiet, sheltered life. None of us knew anything about this until last year, when, 80 years after the rheumatic fever, she was told she needed to have open heart surgery. I talked about that experience in this blog post: https://madcapchristianscientist.com/2012/05/28/the-world-outside-akkima-theresa-and-the-man-in-the-fairy-wings/ . I’m happy to say that now, one year later, Moz has completely recovered from the surgery. Once again she’s puttering around her garden, feeding the birds, singing her songs, sharing her sense of humor and her huge capacity for love with everyone she meets. I’m so blest – happy I can still pick up the phone and give her a call and hear her voice. Happy i can still see her and talk with her and be enriched by her wisdom and kindness and humor. May all who have nurtured and loved and cared for others know how appreciated they are this Mother’s Day. God bless. So, have you ever, like, disagreed with what someone was saying, and been told “I’ll pray for you” in response? Could it be that if we’re seeing some fallible, imperfect mortal when we look at someone else, it’s our OWN perception of God’s perfect creation that needs to be corrected? Could it be that it’s not the OTHER individual who needs to be “prayed for” – but that we need to be praying to correct our OWN thoughts? It seems to me there’s a certain un-Christly smugness about the thought that someone who disagrees with our mortal opinions and beliefs needs to somehow be “fixed” to conform with how we think about things. And telling someone who doesn’t want our prayers that we’ll pray for him is really pretty presumptuous, isn’t it? A Christian Science teacher once made the analogy that unsolicited prayers are akin to going, uninvited, into someone else’s home and re-arranging their furniture. I think we need to be careful to mind our OWN business, to mind our OWN thoughts, and trust that others are being led – just like we are – no more and no less – by God and Truth, too. In the chapter titled “Prayer” in Science and Health, Eddy asks: “What are the motives for prayer? Do we pray to make ourselves better or to benefit those who hear us, to enlighten the infinite or to be heard of men?” Are we praying with humility, quietly putting ourselves “in the closet” as Jesus admonished us to do, and humbly drawing our own thoughts near to the heart of Love and Truth? Or are we trying to use prayer as a sort of bully stick – trying to knock others around until they agree with us?